And….it’s December! My favorite month of the year, after January 😛 When we think of December, we probably have a picture of feasts coming our way. It’s both a sweet and bitter experience we have to go through each year: as we indulge ourselves into Christmas cake, fresh baked goods, superb New Year feasts (many rounds for some of us), we spend time into the night thinking about what we have eaten and feel (quite) guilty about the pleasure. So…what else can we do apart from feeling so guilty? Here are some of the ways you can save yourself and prepare for the next normal routine of eating! 1. Make your digestion process go smoothly. After you eat, your intestines and stomach are still weak, hence, cannot digest well, To help it to work well even in the case of a lot of food, you should regularly take care of your lifestyle. Instead of drinking “cold” drinks, which would burden your intestines, opt for “hot” drinks such as green tea, which contains the slimming elements to say it simply. Also, eat something that is really soft and easy to digest. I usually went for boiled rice or congee, or just veggie soup. Avoid steak, grilled chicken, or anything that requires cutting and chewing extensively. This can be done very easily by placing one pillow on your back and lay on it. This position will put your stomach at the highest point of your body and you can feel your body stretched. Just don’t put it too high and put at least 30 minutes after your meal before doing this stretch. This would help activate your blood circulation and digestion, which would make it harder for fat to be accumulated. Generally, it is said that it takes 2 weeks for the food you’ve eaten to turn into body fat. Hence, do something about it within the first 48 hours may help prevent your weight gain. 1. GINGER: contains enzyme that aids digestion and increases metabolism, hence you’ll burn more. Needless to say, ginger is one of the hottest ingredients in diet products in Japan right now. 2. BITTER MELON: contains Linoleic acid which helps break down the fat and burn energy. Also, it takes stored fat and uses it as energy as well as promotes the action of the recently known good “brown fat.” Eat it with eggs would ease its bitterness. 3. SEAWEEDS: (such as wakame, mekabu, konbu, or hijiki) contains Fucoidan, which prevents the absorption of fat into your body and disposes out. Seaweeds also contain Fucoxanthin, which reduces fat storage and uses excess fat as energy. 4. PINEAPPLE, KIWI, PAPAYA: contain an enzyme Protease, which breaks down protein and helps with digestive process. They also contain Potassium which helps dispose excess water, hence, prevents swelling/bloating. 5. LAMB, BEEF, OR RED PORK MEAT: contain…the famous “L-carnitine” which not only burns fat you recently take in but also the stored excess fat. It’s in red beef/pork meat, but even more so in lamb meat. Per 100 grams, lamb contains 2 times and mutton contains 6 times more L-carnitine than pork does. I hope now you have some backup plan and don’t be afraid to welcome the joy of feasts coming this year end! Posted in Fun Food knowledge! Maybe you’re on a diet and are doing pretty well during breakfast and lunch. But when it comes to dinner, you may find yourself fall into the traps of hunger and self-rewarding. 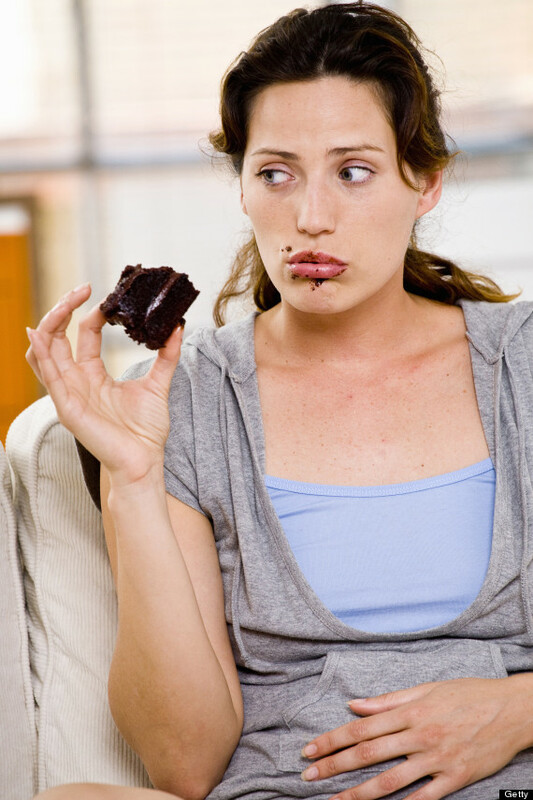 You end up eating too much and feel guilty afterwards for ruining your diet routine. Don’t worry! Because there are many techniques you can try out to prevent yourself from overeating IN ADVANCE! DO RESEARCH. Find out in advance where you’re going if you have a date with friends or are invited to a party. Check out the restaurant’s menu in advance and see if anything is harmful to your diet or is there anything you can eat. Even better if you can be the one who chooses the restaurant! EAT CLEAN. If you know that there’s gonna be a course menu or big party meal during dinner, make sure you have CLEAN breakfast AND lunch. NO SKIPPING MEAL here. “Clean” just means regular meal with enough protein and nutrients. Try to avoid any fatty fried food or high-calorie items during the day. HAVE MID-AFTERNOON BREAK. This is really important! See what time you have to meet up and have the following snacks in BETWEEN your lunch and the dinner. – nuts : I rely on almonds! I usually eat about 8-9 almonds max. These little nuts really help stop your hunger!! – soy milk : chose those without added sugar. Stay away from the fancy colors and flavors and stick to the plain old soy milk that will give you high protein! – water: Okay, last method… if your stomach is still empty, just load it up with lots and lots of water!! WEAR TIGHT OUTFIT. This is just my optional advice. Wear your skinny jeans or something with right belts, or form-fitting top. You will be naturally aware of your appearance! Wearing tight jeans could REALLY WORK because you will kinda stop eating after you feel super uncomfortable. Just listen to how your body feels. – ask to cut your own piece and get a slim slice. BE CHOOSY. During dinner, just stick to the commonsense of diet principles. Veggies, lots of protein, no creamy dressing or fried food, and no beer or cocktail. Wow, that sounds tough but…you need to be conscious. One way to do always leave a small pile on your dish so that you would feel like there’s always something left on your plate. A glass of wine is fine but a series of soft drinks (including juices) is not. Be careful of liquid; the calories can add up fast. FOCUS ON TALKING. In the end, you’re there to talk to people. Just enjoy the company of your friends and focus on having fruitful conversation. Take your mind of food and you might be less tempted! Hope these tricks would help you to survive the next birthday party! Japan has finally embraced the health trend of “coconut water” from the US. But do people really know what it is good for or why or when to drink it? Let’s check it out! 1. It is said to be a natural “sports drink” as it helps recover many nutrients after workout. For many people in tropical countries, coconut water is just like one of the juices that we drink for refreshment. In Thailand, we drink it all the time..or at least when we spot it! it has has less sugar than many sports drinks and much less sugar than sodas and some fruit juices. It has simple sugar that can be absorbed easily, as well as electrolytes and minerals to replenish your body from dehydration. 2. Don’t get confused with coconut “milk”. Coconut water can be found inside the fruit once its top is cut open. Normally, we just drop a straw into the fruit and drink it fresh! Coconut milk, on the other hand, is extracted from grounding the coconut white flesh together with the juice to get white concentrated liquid, which by the way has a bit of unique smell…Coconut milk is used a lot in cooking (eg. soup and desserts) to give a very rich flavor and texture. Be careful of the amount of coconut “milk” as it is very high in saturated fat. 3. Its appeals are that it has lower calories with very little fat but comes with packages of nutrients. – Per 240 ml (1 cup), the calories are only 46 and almost trace amount of fat. – contains Potassium more than 2 bananas. – has Magnesium, Calcium, and other nutrients that help rep up the enzymes and activate your metabolism. 4. When to drink it? AFTER you exercise and sweat, or after coming up from Ofuro. It would really help re-hydrate you after you lose some nutrients along with your sweat. However, make sure you only drink 1-2 servings a day and not more (just like how you would drink your sports drink). 325 ml of coconut milk contains about 450-680 mg of Potassium so you don’t want to overdo it! (females should take about 2000 mg of Potassium, and males 2500 mg a day) When combined with other food you’ll be eating in one day, it could be very easy to overtake it so…just be moderate as like any other food. Now that you know what it is and when to drink it, next time you might wanna grab it with you on your trip to the gym. One bottle has 89 calories less than 140 kcal in normal version. However, it still contains more than 4 tablespoons of REAL sugar. Why launched this? As more research attacked diet coke and coke zero (actually anything soda with the name “zero”) that it may contribute to weight gain rather than weight loss and “artificial” sweeteners are not warmly welcomed either (they are charged with the same penalty)…Coca-cola turned to the only sweetener that is exempted from health critiques – STEVIA!! Stevia is a natural sweetener that comes from plant, thus, it is “natural”. Maybe some of you would think that Thai food is always safe when it comes to diet (or safer than Chinese at least). As a Thai, I would really urge you to think again. Each restaurant makes food differently and calories might vary from one to another. However, as the standard way of making some basic menus is quite the same, I wanna share here about the calories behind the most popular Thai dishes in Japan. And you be the judge! I can’t deny: this dish is the most popular, flavorful, and quickest that you can order. Especially, if you go to the place where they make fried-egg in Thai style for you, it will even harder to resist. (Thai style fried-egg is VERY crispy around the edge as the egg is drop into a wok full of lots of oil, as pictured above) The amount of rice might vary but would definitely be more than the average amount we eat in Thailand. Thus, this would add up to the calories unfortunately. Normally, Kapao dish would range between 550 – 630 kcal, but might go up to 750 if you order Oomori in Japan! However, if you look at the components of the dish, it gives you pretty good amount of protein! How to go about Kapao if you’re on a diet? 2) Ask for small amount of rice (少な目にする）or ask for a separate dish, then HALF (or more) your rice. What is left on your plate would be what you’ll eat. 3) If cucumber is provided, you can try ask for more. If soup is in the set, drink the soup first so you’ll be full easier; help stop yourself from eating unnecessary calories that could be left behind. Another popular dish that is served in almost all Thai restaurants here. And as Japanese love for noodles is second to none, they usually add more amount of noodles in this Pad-thai dish than is usually served in Thailand. It ranges from 545-600 kcal and can go up to more than that if more noodles. Why are the calories so high? Well, if done in the traditional way, we use a wok and fill it with lots of oil, then go a couple of eggs, tofu, noodles, bean sprout, dried shrimps, etc. and seasonings such as (quite a lot of) sugar, peanuts, a bit of chili, and so on. We usually have several kinds of veggies to eat on the side but those are rare in Japan so the plate usually come out pretty bare here. The way Pad-thai is made here might vary and some may not be as oily as others, but still, you should keep in mind that this menu is one of those with high calories. How to go about Pad-thai if you’re on a diet? From being a basic menu in Thai cuisine, green curry has ascended into a more international rank: it’s served in most of the cafes in Japan and has so many kinds of variations. However, the authentic one would incorporate real coconut milk, chicken, eggplant, and lots of different herbs. It is generally a healthy menu! And I’d recommend your order this as one bowl of this would be about 240 kcal. Not too bad, right? 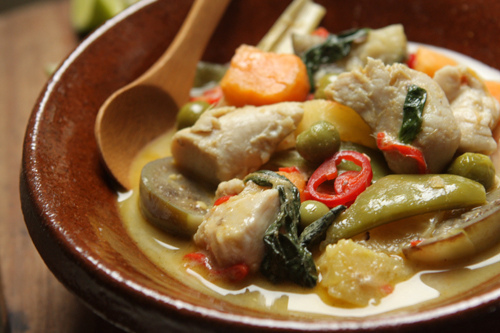 How to go about Green Curry if you’re on a diet? 2) DON’T DRINK THE SOUP. When you’re done with the meat and veggies and rice, and there’s some soup left, you don’t need to drink all of that. Why? Because although coconut milk receives some halo that it’s good for your health, it is high in saturated fat so the right amount is the key. You might save yourself a hundred calories sans the soup! This healthy-looking dish needs your attention! The steamed chicken is, YES, healthy. BUT the rice is definitely not good for your diet plan as it is full of oil which gives it the amazing aroma and taste that goes so well with the chicken! One dish ranges from 596 kcal and up. This does not take various sauces into account. Generally, it CAN be a very healthy menu that you want to order. Just keep in mind that if there’s another variation of this, called fried-chicken with oily rice (Kao Man Kai Tod), just ditch it altogether. How to go about Kao Man Kai if you’re on a diet? 1) Ask for normal white jasmine rice. HALF it if it’s too much. This saves you hundreds of calories so it is a MUST! 2) Ask for more cucumber. More veggies is always good for ya! 3) See if you can get okawari for the soup. Usually it is a special kind of soup that is only served with this menu. You should drink the soup first to start your meal. See if the soup is oily, if not you might ask for the second serving to replace the rice that is if you halved it. Now enjoy the spice and keep your diet on track! Following the introduction of Chitosan in my previous post, this time I wanna raise another popular health key term in Japan: Catechin (or pronounced as Kai-te-kin in Japanese). You can see catechin being included in so many tea drinks in the convenience stores, accompanied with a claim that they could help you burn your body fat. What is up with this health trend? And how does this catechin really work? You need to know here that drinking a bottle after an unhealthy meal doesn’t cancel that meal, make it healthier, or block the fat from entering your body. Drinking catechin should be seen as an accumulated effort in constructing a new inner body system that would be easier to burn fat. It’s actually a long-term effort. According to a research, you will start seeing result after at least 3 months of DAILY consumption. It is a type of natural phenol and antioxidant, a part of the chemical family of flavonoids, a term that might be frequent with which can be found in soy products, cocoa, or red wine for example. (Wikipedia) Among its many types of catechins, only one of them is said to have this effect: Epicatechin gallate (ECg) (let’s call it “Gallete-type catechin”). How it helps reduce fat in your boday? To make it simple to understand: When fat is consumed through food, it would be absorbed in small intestine, where the digestive enzyme called Lipase breaks down the fat particles so they can be absorbed. Gallete-type catechin blocks the action of lipase, thus, lessens fat to be absorbed into the body. On the other hand, when cholesterol is consumed, it would be incorporated into small particles called micelles produced by bile that’s released from the gall bladder. These micelles would in turn be absorbed into the body in the small intestine. Gallete-type catechin would extract the cholesterol from these micelles, thus lessen the cholesterol level to be absorbed into the body. Now, if you’re on a diet or on a clean eating lifestyle and don’t wanna risk your waistline or spending time feeling guilty after visiting an Italian restaurant, here are some good tips! I know pizza and pasta are the perfect traps that are so hard to turn down, especially when you’re among friends, but you really don’t have to limit yourself to one plate of salad. In addition to food, you should also enjoy your companions and spend quality time. Pasta dishes in Japan are pretty huge in size. You would normally get more than 1 serving, sometimes almost 2-3 servings per dish. On average, you will be consuming more than 500 kcal. But it is not always about calories! It’s more about what the food contains, which is a crucial factor to an overall quality of your meal. So, you can still go and enjoy a get-together with your friends over Italian food and you’re your diet on track! Choose your pasta sauce. Look for any dish with tomato- or oil-base. Skip those with cream – yeah, those with white creamy looking sauce; say bye-bye to Carbonara for a while. Oh, and this includes cream tomato sauce, too. Pasta with olive oil base can be really good for you unless the chef makes it too oily. Also, don’t wipe up all the sauce or else you will end up taking in unnecessary calories you don’t need. Choose your pasta. Choose the slimmest noodle possible. If there is a choice of “angel hair” then choose it over ravioli or penne. If whole wheat option is possible, choose that over the plain white pasta. Mostly in Japan, though, you’ll be presented with various kinds of spaghetti. In some places, you can also use how many grams you want. That option is usually for guys who heavily dope on carbs. Always ASK if they can make your dish with 100 grams of pasta. (I used to see such option labeled as the “lady’s set”). Choose your proteins. Look for menus that include more protein such as minced chicken, minced pork, nama ham (prosciutto), or seafood. Feel yourself up with good protein instead of simple carbs. Be careful of your salad. If you go to family restaurant, salads can be the killer. They will fill the bowl up with mayonnaise or creamy dressing. Choose salad with lots of LEAFY green and opt for olive oil and balsamic sauce or lemon. Also, always ASK for the dressing to be served SEPARATELY. This tip really means a lot and it may help you save more than 100 kcal. Same thing with grated cheese, ask it to be provided on the side so that you can sprinkle it on your own. Give it half to one tablespoon. If you need more flavor, ask for salt and pepper, especially those that come with the miller. You will love the fresh smell and tanginess of pepper! Choose the right soup. When it comes to soup, always choose CLEAR over CREAM. It’s that easy. During your diet, you don’t need butter and cream. Rather, you will want to choose veggies soup to warm your stomach up and reduce the hunger that would make you jump into the main dish later. You’ll be surprised that at some restaurants, clear and creamy soup can be more than 100 kcal different. Skip the soft drink set. In Japan, it is very common that you’ll have a choice of paying a little bit more to have a soft drink. This gives you a choice of Coca-Cola, sprite, ginger ale, orange juice, grapefruit juice, milk tea, iced/hot coffee, etc. This is when you should be careful! If you have a choice (meaning, not included in a lunch set for example), you can just skip it and just order WATER. If the soft drink is included in your set, choose Oolong tea! It would help slow down the fat absorption process in your body. Never order juices or milky tea/coffee or any soft drink during your diet. You’ll be consuming a lot of empty calories – all of which is sugar. L For wine, have a glass if you REALLY need to. Just remember a glass is supposed to be the limit if you plan to have a hearty meal. What about pizza? Personally, I wouldn’t advise you to go near pizza just because it is harder to get around it. You will be eating carbs and cheese. And although you order something plain like tomato, mozzarella cheese, and basil (which, by the way, is simply a divine combination), it would be hard to control your caloric intake. Just to be safe, order something else. If your friend insists you have a piece, go ahead but leave the edge. BREADDDDD. This might be the hardest thing to resist or monitor. You could say no to warm crispy bread especially when it comes with butter. When presented with a basket of bread, set it in front of your friends, far away from you. Take ONE SLICE of baguette (as is often served in Japan) and skip the butter. Better yet, pass BOTH bread and butter if you know you’re gonna be eating pasta afterwards. If there is a meat/fish dish, choose it over pasta/pizza! Beautiful piece of LEAN protein (such as fish, lamp, or Tenderloin steak) would leave you no guilt. Just be careful to avoid those with MASHED POTATOES. Dessert anyone? I’d suggest you pass the dessert. But if you NEED to, don’t panic, go straight to one word: “sorbet.” It has the lowest calories in the whole dessert menu, if not including fruits. Lemon sorbet or anything sour would clean your palette really well but won’t leave your stomach heavy. You won’t wanna be loading in other 300-400 kcal after a whole meal. Rather, reward yourself (if you need to) with refreshing sorbet that would score around 100 kcal per serving. Just be reminded that although low in fat, it is still high in sugar. Hope these tips would help you to navigate through the menus and fail-proof your diet journey. Don’t let yummy Italian food ruins your diet attempt. Or on the other hand, don’t be too stressful/restrictive about dieting that you forget to enjoy amazingly tasty food. They can go together hand in hand; you just have to know what to choose! Next time you visit a restaurant, look for tomato based pasta, ask the waiter to reduce the serving size, ask for water or oolong tea, ask for a separate bowl of salad dressing or cheese topping, choose clear soup, be careful to take just ONE slice of bread, and choose sorbet if dessert is to be had. Good luck and enjoy good food!